Mountain Moving & Storage offers over 12,000 square feet of climate controlled and non-climate self storage units. Our individual units are locked, accessible only by the customer and facility manager (if necessary), range in sizes and monthly costs. Storage unit size requirements will depend on the amount and size of your furniture as well as the number of boxes you have. A Mountain Moving & Storage sales representative can estimate approximately what your storage requirements would be based on the size of your home. Monthly prices for non-climatized units range from $95 to $425 per month plus HST depending on the size and from $80 to $295 per month for climate controlled units. Non-climatized units range from 6’x12′ to 20’x24′. Climate controlled units range from 5’x5′ to 12’x20′. Furniture from a one-bedroom apartment without appliances, also small items and boxes. Mountain Moving & Storage offers every customer a Premium Lease upgrade option to extend some coverage in the event of a loss. Customers who opt-in to this feature have a Zero Dollar Deductible in the event of a claim. Because of the no-deductible plan, many of our customers use the Premium Lease as a secondary plan to cover the gap between their homeowners or renters insurance policies and our premium lease. Is Mountain Moving & Storage Responsible For My Items? 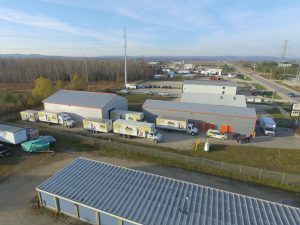 By definition, self-storage properties do not exercise care, custody or control over your stored goods and therefore have no liability for any goods stored on the property. This means that any self-storage provider, including Mountain Moving & Storage, is not responsible for the goods held within the property. Each customer’s lease agreement outlines these terms and reiterates that the customer is held responsible for stored items and promises to never store items that are prohibited or illegal. That sounds a little harsh, right? Rest assured that we’ve got your back. Mountain Moving & Storage’s Premium Lease option is exactly that – an upgraded lease that covers loss in the event that we neglect the property or in other instances of damages or theft. We also go the extra mile to provide a clean, well-maintained storage property for you and your items. That means that we limit access to our properties and use gated access control so that only our customers have access to the property. We also encourage customers to use sturdy disc locks, which deter theft or break-ins. Yes, Mountain Moving & Storage assumes no liability for the items you store; however, we know that rare events can happen. When the unfortunate does happen, we’ve been able to satisfy customers by helping them file a homeowners claim or by giving them a compensation check from our Premium Lease plan. Seeing the relief on a business owner’s face when there’s a check to cover the cost of replacing tools or inventory means that entrepreneur can still keep the doors open. Or knowing that a family can replace their furnishings and goods means they’ll be able to have a comfortable home. We’ve been able to satisfy customers and offer some restoration when the Premium Lease is in place. On the other hand, customers who opted-out of the Premium Lease and had no alternate coverage have no way to regain the value of their lost goods. For this reason, Mountain Moving & Storage requires that every tenant has coverage for a loss either by carrying insurance through their homeowners, renters, or business policies or by opting-in to the Premium Lease plan. The best plan is to have the Premium Lease along with insurance coverage through a third party policy. At Mountain Moving & Storage, we will do everything in our power to keep our storage facilities clean and dry. But what if something happened? Let’s say a big storm blew in, the roof leaked and your things got wet and ruined. At the other guy’s place you would probably collect nothing and have a total loss. At Mountain Moving & Storage, if you signed up for the Premium Lease and the same storm blew in and your things got wet and ruined, you’d get a check for compensation for the Actual Cash Value of the items up to the plan limit, with zero deductible. Your Mountain Moving & Storage lease requires that you provide coverage against loss for your belongings. This is one of the best ways to satisfy that lease requirement. The Premium Lease is not a self storage insurance policy; it’s a way for Mountain Moving & Storage to accept a certain amount of liability under certain circumstances. Mountain Moving & Storage’s Premium Lease has no deductible. If you already have a renters insurance or homeowners insurance policy, it may not cover storage outside the home, or it may have high deductibles. The Premium Lease can be used in addition to your homeowners, business or renters policy. Coverage up to $10,000 against fire, smoke damage and theft. Coverage up to $7,000 against some water damage. Fire, smoke damage and forced-entry theft are covered up to $10,000. Limited instances of water damage, like roof leaks and overhead water pipe leaks are covered up to $7,500. Not every loss is covered and not every item you might place in storage is covered. Here is a short list of these exclusions, see the lease addendum for complete details. If something were to happen to your belongings you will thank us that you have the plan. Things hardly ever happen, but we require our customers to have coverage, because we don’t want them to be left out in the cold in some crazy situation. You might feel that way now, but you might not feel that way if your belongings were destroyed somehow. If something were to happen to your belongings you will thank us that you have the plan. Things hardly ever happen, but as one of the largest self storage providers, we know crazy things happen on occasion. We don’t want you to lose anything. Some policies have time limits and may only cover you for 30 or 60 days of storage. Some have high deductibles and our coverage could bridge that gap. If something were to happen to your belongings you will thank us that you have the premium lease. They are doing their customers a disservice. If something bad happened to your things there, you would collect zero. If something were to happen to your belongings here you will thank us that you have the plan. If you have experienced loss or damage, see your local storage manager immediately. Do not remove any items from your storage unit. The store manager will give you a form to fill out. He or she will take pictures and fill out his or her own report paperwork. If forced-entry theft is involved, we will need a police report. The reports will then be quickly reviewed by our claims department before issuing you a check for your loss.